NEW YORK -- Some of them may be long shots to make the podium, but one thing is certain about the top-ranked Americans who are running this weekend's ING New York City Marathon: They all have fascinating stories. 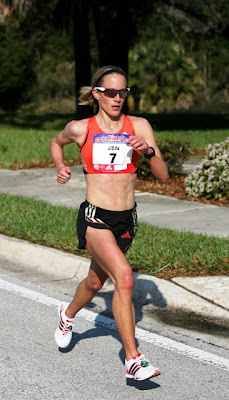 Take for instance three-time Olympian Jen Rhines, a seasoned runner who has represented her country in three different distances at the Games across a career that has spanned some 14 years at the professional level. Six years ago, she debuted in New York with a 2:37:07, a time she isn't particularly proud about now. "I had no idea what I was doing back then," she recalls of that race. "This time, I'm stronger and have a better understanding of how to run the marathon." Rhines likes to think of her race this year as a marathon re-debut, a fresh shot at the 26.2-mile distance. It's been nearly six years since her last marathon attempt in Rome in 2006 (she ran her personal best there of 2:29:32), but Rhines's potential isn't to be dismissed. She isn't an old pro out to make a final victory lap through New York's five boroughs. Rhines is on one serious comeback. This year, she won the U.S. 15-K and Half-Marathon titles, competing against runners ten years her junior, and made the USA team for the IAAF World Championships. "Back then," she says of her previous days training for the marathon, "I couldn't handle 100 miles a week." Now, Rhines is logging 110-115 miles a week and "feeling great." She attributes her recent success in racing and training to a change in her running mechanics. "I've learned to teach my body to run better," says Rhines, who is coached by her husband, Terrence Mahon, in Mammoth Lakes, Calif.
At the other end of the experience spectrum is women's marathon debutante Molly Pritz. The 23-year-old from Williamsport, Pennsylvania, who trained for this race in Rochester Hills, Mich., is excited about her first shot at the classic distance. "This is an amazing experience," Pritz says with a smile, wearing a pink Mini 10-K t-shirt. "I'm ready for the race. I'm up for the challenge." Pritz, who's career got a boost when she surprised the field to win the U.S. Women's 25-K Championships last May, had been running for the Hansons-Brooks Distance Project up until June before separating from that program. She is now coached by Mark Hadley and thinks her love of hills is preparing her well for the undulating nature of New York's course. "All my long runs are hilly," she says. "I don't like flat running. If it rolls, I'm running it." Between Rhines and Pritz is Eugene's Lauren Fleshman, the two-time USA 5000m champion. Like Pritz, the 30-year-old track specialist is tackling the marathon for the first time, and her debut here has perhaps drawn the most attention (and skepticism). At the recent World Championships in Daegu, South Korea, equaled the best performance by an American woman ever in the 5000-meter distance, finishing seventh. For a marathoner, Fleshman's 81 weekly miles appears to be atypical, but she disagrees. "I have to work within my limits," Fleshman admits, referring to the fact that she has suffered numerous stress fractures in her foot throughout her career, which is why she isn't running triple-digit mileage. "You should never try to train like the athlete you are not." 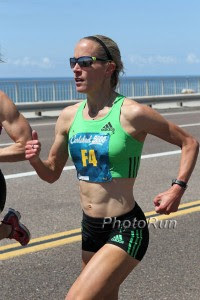 Fleshman, who always appears to have a smile on her face, welcomes the pain and suffering headed her way come race day. "I would be honored to hit the wall," she says. "That's when you know you've given everything you can give." Giving 100% could also best describe the top American debutant on the men's side, Bobby Curtis. The 26-year-old Villanova University graduate has chosen New York City as the place to try out the marathon for the first time. Though he's "relatively young," Curtis, who clocked a 1:01:52 half marathon at the Rock 'n' Roll Philadelphia Half-Marathon in September, thinks the marathon is the "glamorous" distance for professional runners. Soft spoken, but always quick with a quip, Curtis is realistic about his chances in New York: he doesn't expect to be up there with Emmanuel and Geoffrey Mutai. "If I ran the best day of my life, I could probably run 2:09, so I'm going to go out conservative and see what happens," he says. Another American on his debut is former William and Mary All-American Ed Moran. The 30-year-old won his first national title at the 2010 10-K Championships. At 130 miles a week, Moran has been running more than any of the top American hopefuls this year. For him, a native New Yorker born on Staten Island who will marry fiancée Meg Warco a week after the marathon, taking on the ING New York City Marathon is a real treat. "This is the big time," says Moran with a smile. 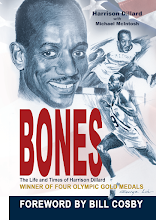 "This marathon is the Yankee Stadium of professional running. It really doesn't get any better than this." Leading all Americans here is 2004 Olympic gold medalist Meb Keflezighi, who won the ING New York City Marathon in 2009. He arrives here on Thursday night and will speak to the media on Friday.